KIEV, Ukraine -- The deal extending Russia's use of a naval base in Ukraine's Crimea is economically beneficial for both Moscow and Kiev, the Russian ambassador to Ukraine said on Friday. The agreement, signed on Wednesday by Russian President Dmitry Medvedev and Ukrainian President Viktor Yanukovych, extends the lease on the Russian base in the port of Sevastopol for 25 years after the current lease expires in 2017, and may be further extended by another five years. 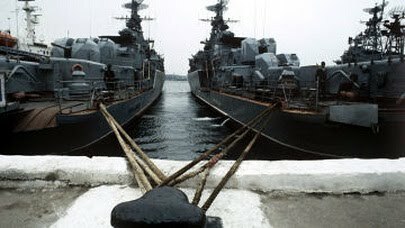 "As far as Russia is concerned, it is not only a question of the redeployment of the Black Sea Fleet or the construction of new coastal infrastructure, but also a broad array of issues related to understanding how friendly our neighbor is," Mikhail Zurabov said. He said the new deal was important for eliminating the remaining "uncertainty" in relations between the two countries. "We do not want to find ourselves in a situation of such high uncertainty and I don't think our Ukrainian colleagues want that either," he said, adding that uncertainty was bad for the economy. Russian President Dmitry Medvedev submitted the agreement to the Russian lower house of parliament, the State Duma on Friday. The Duma has scheduled a plenary session on the ratification of the agreement for April 27 and Ukraine's parliament is due to hold a session on the same day. There has, however, been strong opposition to the deal in Ukraine and it is not clear that it will in fact be ratified on Tuesday. The Ukrainian opposition said any prolongation of Russia's military presence would require amendments to the Constitution as well as a national referendum. Former Ukrainian President Viktor Yushchenko said on Thursday the deal amounts to "military occupation" and urged all opposition and patriotic forces to unite in the face of the threat to Ukraine's sovereignty. Mykola Tomenko, deputy speaker of parliament and a leader of the Yulia Tymoshenko Bloc opposition party said on April 14 that Article 17 of the Constitution forbids foreign military bases on Ukrainian soil. However, on Thursday Ukraine's Constitutional Court ruled the extension of the base lease did not violate the country's Constitution. Yanukovych, who became president two months ago, has pledged to steer Ukraine away from the pro-Western stance of Yushchenko, who vowed that Russia would have to look for a new base for its Black Sea Fleet after 2017. BRIEF COMMENT ON UKRAINE EXTENDING RUSSIAS LEASE OF NAVAL BASE AT SEVASTAPOL!! iT IS GOOD TO MAKE PEACE AND BE ON GOOD TERMS WITH RUSSIA but not at the expense of denying others such as the U.S and other Eurpopean neighbors and some NATO members to maintain friendships diplomatically,economically,militarily and otherwise. ...In other wortds as a journalist and political science analyst on RUSSO-UKRAINE affairs it would be wiser to leave a couple other doors open. NATO has done nothing to harm Ukraine and one can never predict when Ukraine may need them as an ally. Althoguh even not a member Russia still attends most NATO conferences and summit meetinsg so they are keeping theirt relations opn!! ..As for the new administration I would have waited before extending the lease of Russias naval station at Sevastapol and definitely not have extended it that long. I mean it does not expire until 2017 anyway so what was the rush all about!!!!!!! If anything goes wrong within the next few years that agreement may be hard to rescind, even for lower gas and oil prices. I hope this works for Ukraine!